Just wanted to follow up on my last post. The map that my bike came with was causing it to run rich and idle high and gave me about 30mpg on my first tank. I re-mapped using Exleper's map since we have very similar set ups. I took a trip down to San Diego this weekend and average 38/39mpg on the way there. Huge improvement! My mileage coming back up looks about the same, or maybe even a little bit better - haven't killed the full tank yet. Anyway, this is great map, so thanks! In other news, the guy that I bought my bike from showed me receipts from Jett Tuning and explained that this bike had a custom map created there a few years ago. He explained that "every bike is different" and that a custom map is really nice to have. He is supposed to get the map from his son who has it on his laptop and send it to me. We've been texting back and forth and I'm excited to receive the map and see how it holds up compared to Exleper's. It will be especially interesting b/c the maps were both created at the same place (Jett Tuning in Ventura), and we both have 2005 DL1000's with two bro's exhaust and k&n filters! OH MY GOD AGAIN!!!!!!!!!! The bike is so smooth at all RPMs, it pulls hard with out the usual thumpin from below 2k rmp. I had trouble keeping my speed down because the engine is running so smooth. Stock Dl1000 with K&N filter. I will post my map if someone tells me how I can do it. I tried a *.map and as *.xlsx and it wont take them. I guess the forum police got scared? I had all this written before I knew I couldn't upload anything. I ride it 98% on the street, I have no idea what kind on mpg it would get off-road - the Strom and all the other liter plus bikes have way too much power and weight for anything rougher than a slightly bumpy dirt/gravel road, and good luck picking one up - that's what my DR650 is for. Aggressive twisty road riding and 80 mph cruising nets ~37 mpg. Taking it easy it gets ~40 mpg. Attached are the map and a gif image of the dyno data. I got the *.rtf files from the tuner and made my own charts. So you have to zip the files. Attached are the map in *.map form, an excel file showing the original custom map vs my customizing of it, and a gif of the dyno data in chart form. All bike changes were made to the bike before the dyno trip. I loaded some different dj/fuel moto maps, all were pretty much crap yielding mileage figures of ~30 mpg. 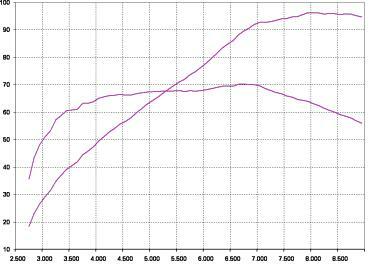 The bike ran substantially better once properly tuned. The same holds true for my other injected bikes - the available maps are all very rich, and attempting to tune seat of the pants is a waste of time. I've never tried the onboard tuner that is available so I don't have an objective evaluation, but the engineer in me says good luck - yeah it will trim an existing good map to make it better, but I doubt it will take one of those overly rich maps and end up as good as a Tuning Link map. We don't have the ability to hold the load/throttle position long enough like the dyno. So you have to zip the files. Funny I had made the suggestion to use ZIP files in a response to your first post about not being able to upload the files. Then I saw this post, so I deleted my response. But thanks for uploading the files I have them stored for future use when I find a deal on a PCIII. Are all of you using the PCIII from Fuelmoto?